Gardeners are people who, you will find, generally are enthusiastic about sharing their experiences. 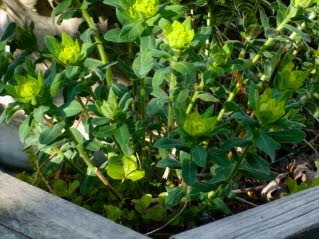 Gardening knowledge is something of a verbal tradition.Many have acquired their knowledge from parents or siblings or teachers who have been blessed with the proverbial "green thumb". Others, like me, have been happy to find that gardeners have often 'taken notes' and also have drawn or painted pictures to show those of us who follow after them what they have learned. So whether it's an Asheville bed and breakfast garden like mine, or some well placed pots on a patio, a garden can be creative and bring happiness to your home. I would expect that there may be as many ways to make a garden plan as there are gardeners. Even I, who came to design my first gardens for my Asheville bed and breakfast just after passing age 50, can think of quite a few. One of my favorites is first to choose an architectural plan, and then for the plant material, to choose a predominant color. Those of you have been to England or seen glorious books that include photos of famous English gardens may have seen "the White Garden" at Sissinghurst Castle that was designed by Vita Sackville-West. It is filled with many glorious varieties of white flowers, as you would expect from its name. But even exquisite white flowers need another color to contrast, to draw attention and to show the white ones to their best possible advantage. At this Asheville bed and breakfast, the gardens are English in spirit, using both English design and exact plant varieties you would have found in "the West country" of England a hundred years ago. Abbington Green Bed & Breakfast "Chartreuse Garden", as you might expect, has a number of varieties of flowering shrubs, perennials and annuals that are yellow and greenish yellow...chartreuse. For contrast, we have included white flowers and some purple varieties in this garden to show off the chartreuse throughout the year. In February and early March, the Winter Jasmine blooms bright yellow when everything else looks gray and lifeless from winter. 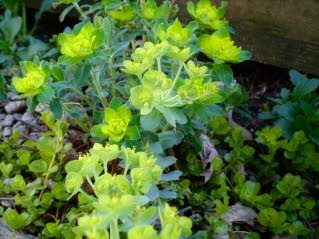 But now is the time when the wonderful chartreuse Euphorbias bloom. Not actually flowers, the 'bracts' of the euphorbia varieties are bright with color now. We hope you'll enjoy them now and, perhaps, add some to your gardens soon.